Meet Inger-Lisa from Montessori Shop! Today I have invited Inger-Lisa from Montessori Shop over to talk a little about herself, parenting and her new online store. Inger-Lisa is new to Montessori and only took over Montessori Shop earlier this year, so I hope you will make her feel welcome! Can you tell us a little about yourself, how you came to own Montessori Shop and perhaps what attracted you to Montessori in the first place? I live semi-rurally in New Zealand with my partner Gareth and we have two young children; our son Arlo is two years old and our daughter Florence has just turned one. I didn't know very much about Montessori at all before Arlo started attending a local Montessori preschool when he was one. We sort of fell in to Montessori due to a lack of other preschool options in our area and I am so glad we did! 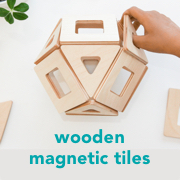 I came across Montessori Shop last year when I was looking to buy birthday and Christmas presents and found I kept going back to the online store because I loved the beautiful wooden toys as well as wonderful variety of Montessori equipment, which my son and other kids we were buying for seemed to be loving! When I found out that the store had been for sale, but was unfortunately going to shut down because no one had offered to take it over, I couldn't get it out of my head. I ended up buying the shop in January this year and am absolutely loving it! How has your life changed since becoming a parent? How has Montessori impacted your parenting? I always knew I wanted to be an at-home mum, but before children the job sounded a lot easier than I have realised it actually is! Having two children so close together (there are 15 months between Arlo and Florence), has also brought with it a lot of challenges, but on a good day it is a lot of fun. Before children I did a lot of traveling, now we are pretty lucky if we get out of town for a weekend, but we are fortunate to have a lot of land, the beach and the bush on our door step. The things about kids that have really intrigued me, is how quickly they develop and learn, how much they comprehend from a remarkably young age and what sponges they are! What we show them and teach them in their preschool years is so incredibly important! I never really appreciated that before having my own children. That is why I have fallen so deeply in love with Montessori, because even though my children are so young and only attend their preschool two days a week, I have been completely blown away by their passion for learning, which is fed so beautifully by their Montessori teachers. Montessori has given me a great sense of intention when it comes to the resources and learning opportunities we give our children. My partner and I are both total advocates for wooden toys over plastic, quality over quantity and a beautiful home environment - all things which fall naturally in line with Montessori as well. One of my favourite quotes is "The greatest gifts you can give your children are the roots of responsibility and the wings of independence." That was said by Denis Waitely. What are your go-to parenting resources, do you have any particular Montessori resources that you would like to share? There are three main area's in my life I am always looking for inspiration and advice when it comes to parenting. These are Food, Play/Learning Ideas and How On Earth Do I Deal With This! For good family food ideas I often look at the One Handed Cooks website and I am currently really enjoying food magazines because they have great seasonal recipes and stunning images! Right now I am loving magazines by Donna Hay, Annabelle Langbein and a New Zealand magazine, Dish. For play and learning ideas I love Pinterest and How We Montessori :) I also take a lot of inspiration from my children's preschool! I follow some really inspiring mums on Instagram such as My Nature Place and Montessori, Montessori Restore and Eltern vom mars. For my How on Earth questions, if my mum doesn't have the answer, we are really lucky in NZ to have PlunketLine. This is a phone number you can call any time of day or night to talk to a Plunket nurse - they offer great gentle, realistic and sound advice. Please share with us, what are your favourite resources from your store (and why)? As we head in to winter I am loving all of cosy craft resources such as our weaving frames and cute knitting helpers. But the pieces I definitely find creeping in to our house the most are the practical life resources. Arlo loves to be helpful and I love the sense of importance he seems to get from having his own 'tools of the trade.' Finally I have to mention our cutting sets. I have seen these in preschools before but we just brought the Breakfast set in to our home and it has immediately become Arlo's favourite toy. He has already spent hours serving up meals for the family (and teddy) at the same time as perfecting his cutting skills. Such a great toy! Thank you Inger-Lisa. 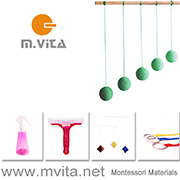 Montessori Shop stocks a wide range of Montessori materials for schools and the home including for infants, I have included some of my favourite materials below! 1. Clothes Horse / 2. Washboard / 3. Wheel Blocks / 4. Mixed Shapes Block Kit / 5. Scale / 6. Large Weaving Frame / 7. Knitting Helper / 8. Bucket Set. You can follow Montessori Shop on Instagram. Montessori Shop has free shipping throughout New Zealand and also ships to Australia and around the world (you can find shipping details here). You know I love a good gift guide! When Otis turned five I promised a gift guide for five year olds (you can see the gifts we gave him here). The difficulty is, at this age, children have so many interests. At five I find children are exploring more about the world around them, showing more interest in animals, fossils, dinosaurs, plants, planets - science! So I've put together a gift guide for five year old's focusing on all things science! Any of these would be a wonderful addition to a Montessori home (or classroom)! 11. Weather - Large Outdoor Thermometer / What Will the Weather Be? Some of these would be good gifts for friends too, some of them are not too expensive. I love the idea of a little book and a pack of seeds! I hope you find some fresh ideas and enjoy! My thoughts on the Light Table and how we are using it. Otis has been so sick today, we were unable to leave the house. Hopefully it will pass soon. So, I thought I would let you know how our light table is going. I really love the light table (source in Australia, and it's still on sale). It is round which I bought intentionally to go on this spare round table. It is super light and thin, it would be easy to put away. It is really bright, the room does not have to be darkened at all to be effective. I always thought they had to be in a dark room or with the lights off, but it is so bright it does not matter. While using the light table has been a lot of fun it isn't an essential tool for our learning. I wouldn't have paid full price for it, getting it at a good price was key. It has been interesting. My kids haven't used a light table before so they have enjoyed playing and experimenting with it. It takes building with our Magformers (Australia here) to another level. Using glass stones to make patterns and shapes has been fun. Using any transparencies is best on the light table. I printed these slides from Mr Printables. We previously used them in a white tray. They are easier to use on the light table and the mixing of colours is more obvious. So far these would have to be our most used materials on the light table. And of course our Animal X-Rays (Australia here) work brilliantly on the light table. I'm trying to keep an open mind on how we can use the light table in the future. It has a little spot where we will keep it out. I'm thinking of doing more art on it, perhaps some tracing, perhaps some painting on transparent paper. Please let me know if you have a light table and if you have any suggestions for us! The boys are finally on school holidays! Over the weekend we went to the Out of the Box Festival, which is a huge arts festival in Brisbane for children 8 years and under. There are very few art festivals specifically for children this young. I love these words from the Festival Director Brett Howe: "This is a festival of little experts and big communities, of bold productions and intimate encounters and of electrifying moments and contemplative experiences." First we went to the Holi Throw. Above Caspar and Otis are suited up ready to go in. This was so much fun and out of the ordinary. They had these pipes you could pump to get the colour to come out. The children were invited to dance like their colour, how does blue dance, how does yellow dance? There is music playing in the background. Otis needed time out, it was a little overwhelming. Covered in colour at the end! I love that the boys could do this together. So many activities at this festival. We also visited the Gong Garden. Caspar loved it so much, here he is getting a lesson on how to use a Gong. With this large Gong you sit in front of it while someone else plays it, you can feel it's vibrations. It's why Caspar is looking a little introspective. And some Nepalese bells. So lovely. I hope wherever you are, you are enjoying the school holidays! Children need three hours a day outdoors - to protect against myopia. I recently read there is no causative link between screen time (yay!) and myopia however time spent outdoors has been found to be a protective factor. Have you seen this see-through classroom in China - they bring more light into the classroom to combat the myopia epidemic. At school both of my children can work outdoors if they like, they have an outdoor classroom which is a bit of a Montessori concept that the children can work seamlessly from inside to outside. I know most of us would agree that Forest or Nature Schools are such a fantastic idea where the built classroom no longer exists. Knowing my children are at school for most of the day and that it is now winter, the days are getting shorter and darker, we have been making more of an effort to spend at least 40 minutes outside every day after school. Most of the time we go for a walk or take a ball down to the park. This lovely area pictured is not walking distance, so we stop on the way home from school, and keep bikes and balls in the boot of the car. The Australian researcher in this report estimates children need around three hours a day outside or in the equivalent light. Without knowing what the boys do at school, I don't know if we achieve this every day, on the weekends definitely yes. This report isn't conclusive, I would suggest that the benefit of spending time outdoors is more than exposure to light. The children are moving faster, looking and focusing on things over distances. And there is the physical movement. But I think the takeaway point is children need to be spending more time outdoors, no matter where they live or what they are doing. The key to getting this extra time outside for all of us is making it convenient. We love to take a hike in some bushland or head to the beach on the weekends, but these are not options on weekdays. Often we will stop at a playground, but I find these so boring. I want to be moving myself, so we grab Otis' balance bike, and I take a brisk walk or run. It is almost time for Otis to move to a pedal bike, we have been encouraging him, but for now, I am happy with whatever he chooses. Soak in all that light Otis! Our Balance Bike is c/o Child.com.au (the red version is currently 20% off here). Does this sound reasonable to you, do your children spend three hours a day outdoors? Why we use a (Montessori) floor bed. When making parenting decisions I always think about what is going to benefit the children in the long term. What can I do today to help them tomorrow? Fostering independence is one of those things. It is harder at the start but in the long run it is of great benefit. While using a crib might be easier in the short term I knew a floor bed was best for my children. The upfront difficulty of using a floor bed is baby proofing their entire room. Why do we use a floor bed? Freedom of movement. Children are not confined, they are free to move, to get in and out of bed. I have found my children are much more active when using a floor bed and slither around then crawl around much more, as their whole room is baby proof there is a greater area they are free to move about in. This is of benefit especially in modern times when children are often confined in a crib, to a high chair or rocker then to a baby car seat or stroller, yes some of these are necessary, however children need every opportunity possible for freedom of movement. Promote independence. Children can get up and read a book, or get dressed, they do not need a parent's permission or help to do so. Over time and especially with an older toddler they can decide themselves when they are tired and lie down. For daytime naps my children would often put themselves to bed and go lie down when they needed to rest. Empower the child. The child can make their own decisions. This is especially applicable for a toddler who is able to get out of bed and play rather than cry at the crib waiting for someone to get them out. Although the chid may still be confined to their room they have much more power and control over themselves. Respect. I find a floor bed, rather than a crib is more respectful, again especially with an older toddler, it respects their natural needs and their capabilities. The child is not going to sleep because they have no other choice, because they are confined and can't get out, rather the child is making their own decision to go to bed and lie down (and hopefully fall asleep). While there were times my children would wake during the night, have difficultly falling asleep, there were no battles to get into bed. Definitely no screaming or crying to get out. Comfort. This is much less of an issue, however for the child and the parent I find a floor bed much more comfortable. Often I would lie next to my child, breastfeed them and sometimes sleep next to them. This was much easier in a floor bed and could not happen in a crib. I completely understand that a crib is preferred by most parents. I am not trying to convince you or anyone else about the benefits of a floor bed, but rather present some ideas that are not so common. We don't need to explain our parenting decisions or sleeping arrangements but it is good to discuss especially among like minded parents. Please feel free to leave any floor bed questions. Our Montessori Play Areas (2-5 years). I have been asked to post some Montessori playroom ideas. While I was putting together my thoughts I took a look at some of our play areas through the years. Our entire home is Montessori so we don't have any specific Montessori areas or a Montessori playroom. Often the children's bookshelves have been in their bedrooms, their blocks have been stored in seperate areas and we've always had a seperate art area. So the boys toys and things have been spread out around our home. Anyway, here are some images of our play spaces/work areas over the years. Each room features our Oeuf Mini Library (in Australia here) this was an expensive purchase but as you can see, it has been well used. To see in further detail you can click the links. These make me wish I took better pictures, wider angles with more detail, still there are lots of little ideas here! Caspar's Room (at four years). I took a quick picture of the boys work area here today. Next week I will post a round up of some of my favourite Montessori playrooms and work areas. Please feel free to leave a link to your spaces if you would like to share. Today I want to share some of the fun crafts Otis has been using recently. He is really enthusiastic about all of these and will work on them whenever he gets a minute. 1. Pattern Beading. Otis has been using these for weeks, we have the beads and set from Ikea. 2. Beading. We have coloured jewellery wire, wire snips (which Otis can use), lots of beads, metal clip hardware and pipe cleaners. Otis picked out the beads at our local craft store, he likes to make bracelets and key ring holders with the hardware, he also loves making bracelets with the pipe cleaners. 3. Knitting. Otis has been begging for me to teach him how to knit. We started with this chunky scarf. The rainbow wool is lovely, the large knitting needles have made it easier to teach as the stitches are large and more pronounced. If you have a younger child that is interested in knitting I recommend trying French knitting or using a lucet. 4. Using Alphabet Stickers. Otis is in a writing explosion. He loves writing with the movable alphabet and loves using alphabet stickers. I think it's a lot of fun but also educational, exposing him to a whole range of fonts makes him more familiar with the letters and improves his reading skills. Otis will use the stickers to make signs, write letters and just to play around. 5. Cutting and pasting from brochures. Otis loves plant and flower catalogues and loves to cut and paste with them and make pictures and collages. 6. Making Pom Poms. We have a couple of looms that make it very easy for a young child to make pop poms. This is lots of fun and we love working with wool! Weaving would also be a nice activity to try. I would love to hear if you have a five year old and what kinds of craft they like! Over the weekend we had the opportunity to preview a wonderful school holiday activity! It involved ice-cream, chocolate and delicious smoothies! Throughout the school holidays, Cowch have organised a fun experience for kids to go behind the scenes, creating their own smoothies and naked pops. The Kids Cowch Experience is heaps of fun and is also very delicious (you can book here). Cowch is a Dessert and Cocktail Bar located at South Bank, Brisbane. It's a great place to stop with the kids. South Bank is one of our favourite locations and over the school holidays we will be visiting the Out of the Box Festival and the new dinosaur exhibit at the museum. Caspar and Otis started at the Naked Pop Station, dipping their naked ice cream into melted chocolate (dark, milk or white) and then adding their toppings (my boys love sprinkles and mini marshmallows). Next they made their own smoothies! My boys loved this process, being behind the counter and coming up with spectacular combinations to make their own smoothies. The kids are able to select from the various ingredients and use all the equipment themselves. The Kids Cowch Experience is designed to get kids off the couch and into the kitchen these school holidays. The classes are $15 and available at 11am and 1pm, Monday to Friday from 27th June until the 8th July. Sessions run for approximately 30 minutes. Booking is essential as the classes fill up quickly! Thank you to Cowch for having us! Real and Beautiful Montessori Kitchens! Today I have some kitchen inspiration for you. Our kitchen gets cluttered easily so I find these images refreshing. As always, simplicity is key! Above Montessori for the home - a practical guide at Eltern vom Mars - this fantastic site has so many kitchen and food preparation images that are really beautiful! Montessori inspired kitchen corner for a toddler at Chroniques d'une globe-téteuse. Keep an apron nearby and some cleaning tools. I love how warm this space feels with the lovely images on the wall. Beau's Montessori Kitchen Shelf at Belle + Beau. A place for everything and everything in it's place. Practical Life for a Toddler - Spreading at The Free Child. This little shelf is simply divine! Nicole's kitchen at The Kavanaugh Report. I love this shelving set up, this would have worked well in our kitchen. It provides storage and food preparation space. Montessori Kitchen at Our Montessori Life. Beth has used the Ikea kitchen in a functioning way. It's a great size and the basin is really useful. If you have a Montessori kitchen space you would like to share please feel free to leave a link or email (howwemontessori@gmail.com). Setting Up Your Home Montessori Style E-Course and Summer Sale! Today I'm talking to Simone from The Montessori Notebook and Jacaranda Tree Montessori based in Amsterdam. I love following Simone as her toddler environments are always inspiring and she presents really useful information for parents on her website. However, today Simone is sharing with us details about her e-course Setting Up Your Home Montessori Style. This is the first e-course I have endorsed. So why now, why this course? Firstly because I really like and trust Simone. She is an AMI trained teacher. Watch a couple of her videos (there is one below) and you will get a feel for her style and how she communicates. Also because this course is so practical, it is true to Montessori and this is important to me! Let's hear from Simone! It feels like I have known you forever, for those who don't know you can you introduce yourself? I know you have two children but how did you come to Montessori, have you always lived in Amsterdam? I first fell in love with Montessori when my son was still a baby, we were living in Sydney, and we were looking for a preschool for him. We attended an open day at a local Montessori preschool and I found the classroom so beautiful, put together with such care, and all the materials looked so inviting. The teachers spoke with such respect to the children and clearly loved working with them. There was also a parent-toddler class at the same location and I started attending with my son from 18 months old. Oliver is now 15. Before I had my son, I was working in various corporate roles. I realised soon after my son was born that I had such empathy for the youngest children and, from attending the parent-toddler class with my son, I decided to re-train as a Montessori teacher. It was certainly a juggle having two young kids whilst doing my Montessori training, but it was completely worth it. We moved to Amsterdam 10 years ago to live closer to family in the UK. We only planned to stay one year. Each year we kept deciding to stay longer. The kids were at a Montessori primary school (Montessori is in the public system here!) and the novelty of cycling everywhere still hasn’t worn off. I love it here in Amsterdam. I started my own Montessori parent-toddler classes here in Amsterdam at Jacaranda Tree Montessori. I run 8 classes a week, run regular parent workshops too, and work with the loveliest families. My first real experience with Montessori, other than reading books and blogs, was attending a parent-toddler class. Caspar was eighteen months old at the time and it was life changing. What are the benefits you see of parent-toddler classes? I love watching both the parents and the children develop alongside each other in a parent-toddler class. The children are so happy to explore in an environment that is engaging. While the parents can learn how to follow their child, how to respond to their child, and how to set up their homes in a Montessori way to give their child independence and to involve their child in their home life. The parent education part is so important to me. When the parent also learns about the Montessori approach, they are able to bring Montessori into the home and daily life. And the child can benefit not just when they are at school, but 24/7. Can you tell us a little about your e-course Setting Up Your Home Montessori-Style? What is the aim of the course and how can it help parents like me? I speak to so many parents who love the idea of setting up their home with Montessori principles, but either don’t know where to start or just don’t get time to do it. So the Setting Up Your Home Montessori-Style e-course is designed to help parents get rid of the clutter and to set up engaging and beautiful spaces at home. The e-course is a fun way to work your way room-by-room through your home, applying an easy 5-step process. The course is 4 weeks. Every few days you receive a new lesson by email, the lessons can be viewed as a video or read as text. And at the end of the course, you will be able to see your home through your child’s eyes and restore calm to your home. What advice can you give to parents wanting to know more about Montessori in the home but don't have the time for an e-course? If you don’t have time for an e-course, you can find a lot of Montessori inspiration on Pinterest or Instagram. I have a 3 minute video you can watch (see below). For me, Montessori is not just about the activities you have in your home, but how you live with your child. Learning to guide them. Accepting them for who they are. And exploring the world together. Simone has a talent for setting up beautiful children's spaces! If you are wanting or needing help to set up your your home Montessori style, I recommend taking a look at the above video and the e-course. This is also a lovely video of a small space Montessori home. You can find Simone at The Montessori Notebook, or at Jacaranda Tree Montessori (Amsterdam) or find out more about the e-course Setting Up Your Home Montessori-Style here (currently 25% off for three days only, finishing Sunday 19th June 2016 at midnight PST). The e-couse is currently US$59 (usually US$79). The e-course is self paced, includes access to a private Facebook group and has been enjoyed by parents all around the world. Update 20th June; the Summer Sale has now finished. However, you can still join the e-course here at the regular price of US$79.00! Why Montessori has multi-age classrooms (and why siblings often learn best from each other). "Our schools have shown how children of different ages help one another. The younger ones watch what the older ones are doing and ask all kinds of questions, and the older ones explain. This is really useful teaching, for the way that a five year old interprets and explains things is so much nearer than ours to the mind of a child of three that the little ones learns easily, whereas we would scarcely be able to get through to him. There is harmony and communication between them that is not possible between an adult and such a young child. There is a natural mental osmosis between them. A child of three is also quite capable of taking an interest in the work of a five year old, because in fact the difference in their abilities is not that great. People are concerned about whether a child of five who is always helping other children will make sufficient progress himself. But, firstly, he doesn't spend his whole time teaching, but has his own freedom and knows how to use it. Secondly, teaching really allows him to consolidate and strengthen his own knowledge, which he must analyse and use anew each time, so that he comes to see everything with greater clarity. The older child also gains from this exchange." - Maria Montessori. One of the first things you will notice when you walk into a Montessori school is the classrooms are multi-age. The classrooms are generally divided into three year groupings; 3-6 years, 6-9 years, 9-12 years. The multi-age classroom is fundamental to the Montessori method. It's not only Montessori, other schools are adopting this approach. Why do multi-age classrooms work and what are the benefits? Observation. Children are free to observe each other, they are free to observe children working on more advanced materials, they observe more mature social interactions. They observe older children interacting with teachers and learn what is expected. We know children in the first plane of development are absorbing everything in their environment and the role modelling of the older children is of real benefit. Younger children often aspire to be like their older classmates and often look up to them. Through observation alone children can learn so much! Leadership. At some point all children become the older ones in the classroom, they all have the opportunity to be leaders and develop leadership skills. Leadership may include using mediation, conflict resolution, mentoring, negotiating and communication skills. Often leadership is acquired naturally, they step in when they know they can help or assist another child (younger or otherwise) as they have seen it and observed it in others. Confidence. Children build confidence working in diverse groups, talking and interacting with different aged children. They build confidence when they have, or are given leadership roles, and when they can comfortably negotiate in diverse groups of children. Diversity. The classroom is a more diverse environment. Children are working in an environment accepting of all capabilities, there is a wide range of ability, skills, independence, experiences, resources, literacy. Children are not discriminated against based on age. There is exposure to more areas of interest. Sense of Community. The classroom is a community and communities are inclusive, it is a cohesive social unit. The children are more accepting of diversity, they are helpful, supportive of each other, there is greater collaboration. This sense of community can build connectedness and trust. It can foster authentic and child led partnerships. It can lead to good citizenship and meaningful collaborations. Competition is Removed. Due to the diversity in the classroom competition is removed. There is no competition between children as all children are at different stages in their learning, there is or testing or grades used in this environment. The learning is more collaborative because they are all encouraged to look after and help each other, this contributes to a positive learning culture. Connected Learning Experiences. Many materials are used various times during the child's education. The child can see and make connections between when they first starting using the materials and how they may use the materials in the future. Working with others who have similar or different capabilities deepens and extends understandings and makes links between prior and new experiences. Respectful of How Children Learn. Children are resourceful and are active agents of their own learning. Learning from other children is a part of this. This approach is respectful and encourages child-initiated learning and independent thinking. Children learn best from each other! Children can teach each other, can explain and demonstrate things in ways adults cannot. Their hands are a similar size, they use similar words. They can connect, communicate in ways adults cannot. Their abilities are no so far removed from each other, they understand each other. This is why siblings often learn best from each other. Child Centred. Children are not taught to their age but to their abilities. The focus is on the child. The work is at the child's own pace. When children are grouped together for work or a lesson they can be grouped on their abilities or interests. Stable and Consistent Environment. In existing Montessori classrooms there are not thirty or so new children at the start of every school year. At the start of the year new children come into a classroom that is already functioning and can get to work right away. The teachers can often focus on the handful of new children and help them to settle. There is less turnover of children and less disruption. Children are in a stable group, with only few young children joining and a few older children leaving every year and often the same teachers the three year period. I love this recount Otis' teacher once gave me. Otis wanted to bake but he couldn't read the recipe. He found another child who read the recipe to him while he measured and mixed the ingredients. This is collaborative and respectful, this shows how capable and resourceful children are! Otis didn't have the reading skills required and the other child was happy to participate. For both children this was a beneficial learning experience. This is reflective of how our society works. If I don't have the skills I need for my work I will ask someone to teach or to help me. Like any environment, Montessori or otherwise, there are good and not so good examples. If you are interested in seeing a multi-age classroom in action I recommend visiting a Montessori school, looking for qualified and recognised teachers. In my experience as a parent to two and experience with two schools, I have only seen the benefits of the multi-age classrooms and wouldn't have it any other way. Whenever I walk into Ikea I see so many possibilities. I have been interested in their new children's art (Mala), toy (Lattjo) and small furniture (Flisat) ranges! Have you seen them yet? They have a lot of new materials that would be great for a Montessori home. Otis and I visited on the weekend, here is what we picked up! 1. Viktigt Dish - Wouldn't this be lovely on the nature table! 2. Viktigt Basket - Set of Two - The lids also make really lovely trays! Otis has his gems in the smaller lid and they look gorgeous. 3. Besta Storage Box - I wish be bought more of these, they are soft and cozy feeling, really useful (and I love this yellow colour). 5. Lattjo Elastics - For jumping games. 6. Lattjo Yoyo - This was Otis' pick. 7. Pyssla Beads and Bead Shapes - These are not new but it is the first time we have used them. The boys have gone a little crazy for them! The beads on their own are good for threading activities. Great for fine motor skills. 8. Mala Paint - For this price they are worth a try! 9. Rymlig Napkin Holder - This was too cute to pass. We will use it in our art area to hold card, alternatively we could use it to hold the children's mail or envelopes! 10. Ikornnes Table Mirror - This is a great size for a child for observational drawings. 11. Mala Paintbrush Set - The best paint brushes, good shapes and really soft. We get a pack every time we visit. 12. Mala Stamp Pen - Just for fun! 13. Mala Watercolour Box - A great, convenient set up, the cups and brushes fit underneath the paint. 14. Mala Assorted Colour Paper - So practical, nice pack. 15. Duktig Kitchen Utensil Set - Some cute and useful utensils for the kitchen and pretend play. 16. Duktig Baking Set - We have lots of kitchen materials and I love this little set. 17. Molger Step Stool - Otis is going to try and use this simple step stool in the kitchen (and put away his kitchen stand). 18. Flisat Children's Table with Stool - The table has two tubs underneath, this is so useful! Otis is five and it is a great size for him, his legs fit comfortably under it. I also like this book display from the same series. 19. Flisat Children's Adjustable Desk - We didn't get this one, but I wanted to. It was in stock at our local store (Logan) however it wasn't on display and I wanted to see it in person. I would also really like to look at this new adjustable children's table. If you have an infant you might like to read about Oliver's Montessori Room All Ikea - and How To Do It from La Tela di Carlotta. It's Friday and the boys' school had a student free day. The weather has been fantastic so we headed to South Bank for a swim. You can see lots of pictures from today here. I have been reading Helping young children with everyday transitions at Whole Family Rhythms. There are times when Otis struggles with the transition from school when it's time to go home. I've read every piece of advice I can find but I still can't work out what his triggers are. I love this idea for an Alphabet Box (on Etsy). Also on Etsy I love this Children's Tool Set. Junnifa is the best! Here is her wonderful article (with video) 10 benefits of food preparation with young children. Otis and I have been playing games on our deck after school, just as the sun is setting. Above we are playing a game called Animals Tracks and we have also been loving Into the Forest, Nature's Food Chain Game. Our new light table arrived today. I didn't buy one earlier as I didn't see the value and didn't want to pay a lot. I ordered this light table from Educating Kids as the price was fantastic. It's so streamline and bright. I've started setting up a little light table area, let me know if you have any great ideas, we will be using resources we already have. I have started writing for Montessori Shop (NZ), if you would like to read my articles sign up to their News and Updates (at the bottom of their page). Hopefully, you will find the information useful! Below are some fantastic images from a Montessori inspired home in Japan. So, so lovely. Real examples are so helpful and refreshing. Nicole is raising her son bilingual - see the posters above! The low shelves, the weaning table, and chair were custom made. Aren't they gorgeous! I adore the little floor bed and the bookshelves nearby. Did you notice the Montessori themed fabric on the bed covering? Just the most perfect picture below of Nicole's son at eight months! Thank you so much for sharing your spaces with us Nicole!! Montessori Inspired Toddler Rooms - LOVE!! Montessori Toddler Room at Summersplayshouse. This is an excellent post showing why we use a floor bed; you can see this gorgeous little one crawling out of bed and over to her shelves to play! So cozy and with a few hand made touches too! So modern, I love this style! A Scandinavian Montessori toddler room at A Montessori Toddler Room of His Own at Finding Dutchland. This makes a floor bed look mainstream! How to create a Montessori inspired bedroom/playroom at Show Me Montessori. Make sure you click through - I think you might like this blog! I have been asked about shared spaces, this is my boys' bedroom which they shared when Otis was 20 months and Caspar was 5 years old. They only used this room for sleeping, dressing and reading. Not so much about the room, this is a great personal story about using a Montessori floor bed at The Little Things We Do. I also think this bedroom at Chroniques d'une globe-téteuse is really cute! You can see her previous room here - this is a lovely multicultural, multilingual Montessori family (living in the US) to follow!